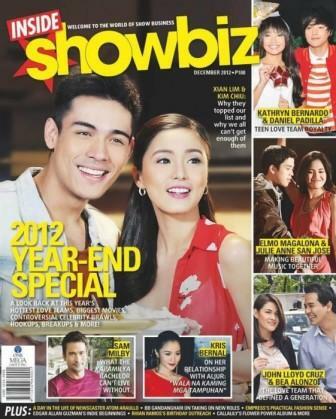 Kim Chiu and Xian Lim Lead the 2012 Year-End Special Issue of Inside Showbiz Magazine! Kim Chiu and Xian Lim is Inside Showbiz Magazine's No. 1 love team for 2012. Yes, the tanden now popularly dubbed as the KimXi is also the magazine's top list for their "2012 Year-End Special" edition, the December 2012 issue. The magazine will tell us why Kim and Xian are today's hottest young stars and why their tandem is very successful in any other fields. Kim and Xian are the lead stars of the No. 1 Primetime TV series in the country "Ina Kapatid Anak." They are also the favorite top endorsers of different brands and products. The tandem of Kim and Xian sparked after the two were paired in the 2011 hit teleserye "My Binondo Girl." Their tandem was even called before as JaNdy pertaining to their cute characters in "My Binondo Girl."